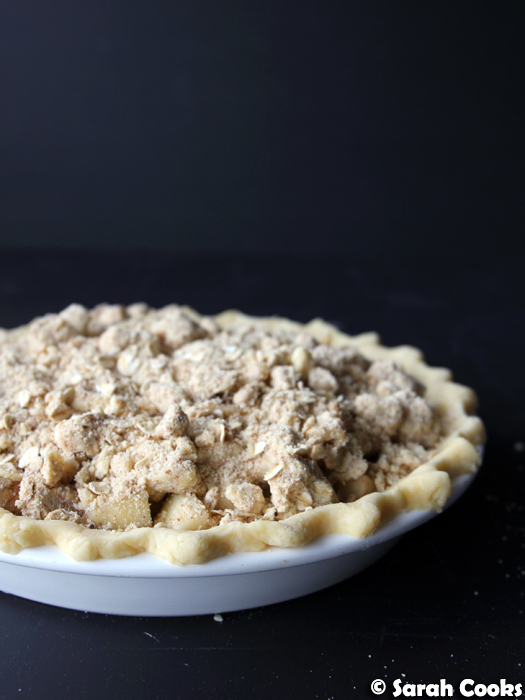 Today's recipe is an apple crumble pie! 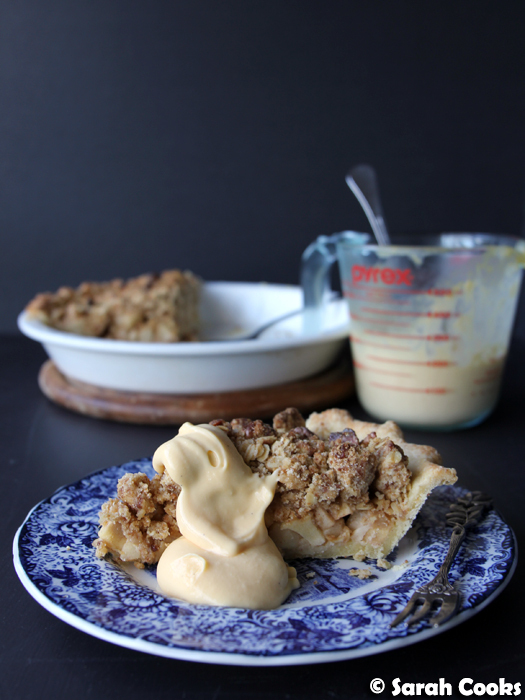 It's a crisp and flaky buttermilk shortcrust pastry case, filled with juicy sweet and tart apple chunks, blanketed with a crunchy mountain of oaty, buttery, nutty crumble. All of the yes! I am baaaaack! Hooray! I cannot believe I only did ONE post in August. Eep. July and August were crazily busy. There were some fun things - a wonderful holiday in Malaysia, and our bachelorette weekend - but there were also some not-so-fun things, with a lot of hectic family stuff just taking up all of our time and energy when we were home. There was very little cooking - lots of takeaway, lots of meals out, snatched snacks here and there - and there was even less blogging. Boo! However, things seem to be calming down now and I'm so happy to be getting back into my routine. Pretty instagrammed breakfasts! Occasional gym sessions! Fun recipes for the blog! Yay! 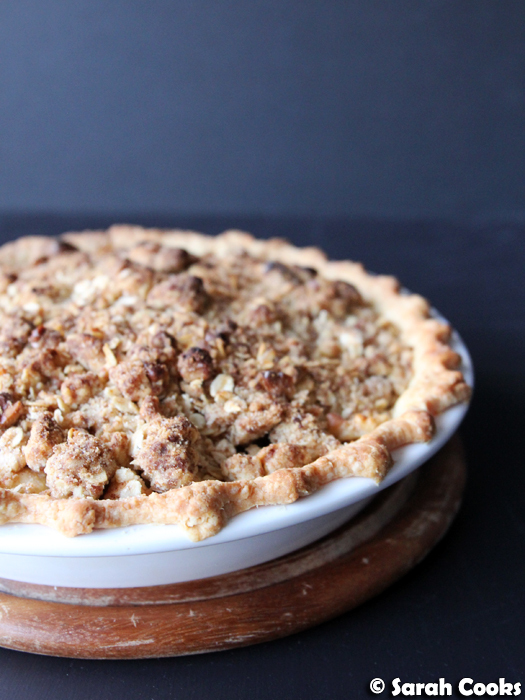 I am really thrilled with today's recipe for apple crumble pie. Two of the world's best desserts, combined in the one delicious package. I had this idea floating around in my head for a little while, and Father's Day last weekend was the perfect occasion to try it out. It was a big hit! Let's look at the details. 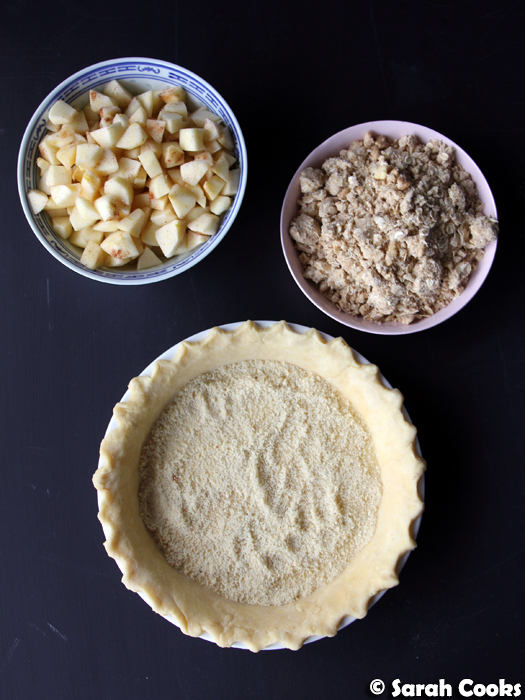 There are three components to the pie - the pastry, the crumble topping, and the filling. 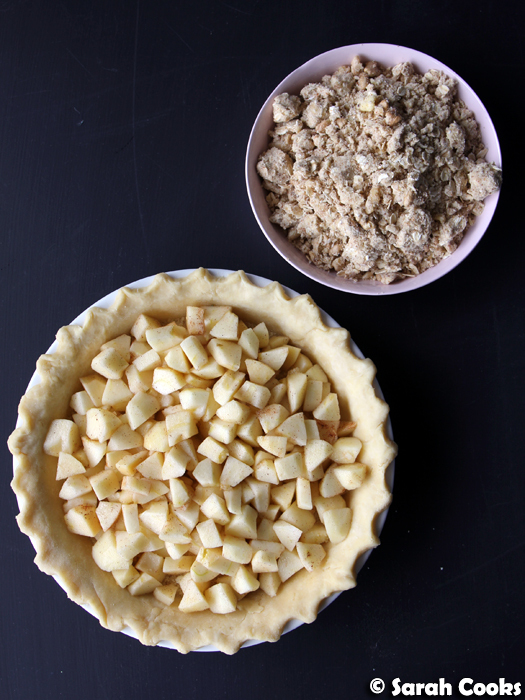 It takes a little time, but is much easier if you split up the components (both the pastry and the crumble topping can be made in advance). So, both pastry and crumble begin with the same technique of rubbing cold butter into flour, until the mixture looks sandy. See below! My go-to pastry recipe is Nigella's very-rich shortcrust, but because I had some buttermilk in the fridge, I thought I'd try Joy the Baker's buttermilk pie crust. It's a shortcrust pastry, with a higher ratio of butter-to-flour than normal; and with buttermilk to bind the sandy flour-butter mixture together. It was easy to work with and turned out very tasty, crisp and flaky. Love! 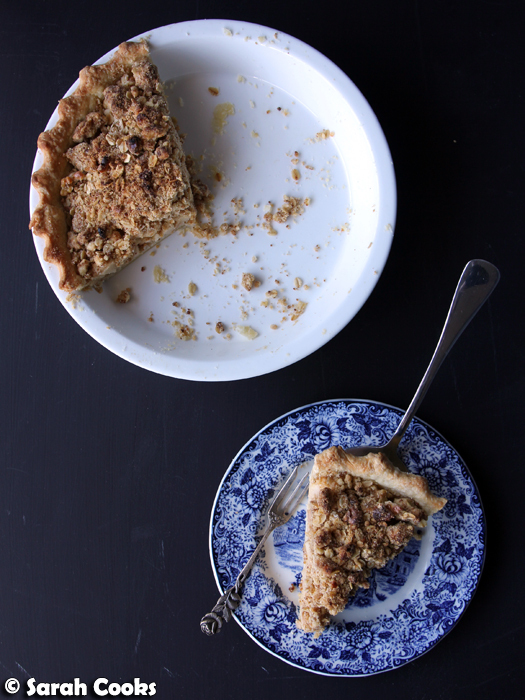 The crumble is extra crunchy, thanks to the addition of oats and walnuts and coconut sugar. (Demerara sugar would work too). I adapted it from a Mary Berry recipe, because she is awesome and her recipes always work! Heads up - the quantities specified below make much more crumble than you'll need for the pie. Keep the remainder in the freezer for future crumble cravings! I always sprinkle the base of my pies with a thin layer of almond meal, to absorb any excess liquid from the filling, and for general deliciousness. And speaking of which, the filling is just chopped eating apples, with a little lemon juice to prevent browning, some cinnamon and sugar. Boom. And here it is, baked! The crumble browns quite quickly, so I suggest keeping it covered with foil for the second half of baking time. So crumbly. Such butter. So delicious. Sandra described it as "such a Sarah dessert", all buttery crumbly goodness. Yup, guilty as charged. I liked it served slightly warm, a couple of hours after it came out of the oven. As you might be able to see, the pastry base turned out slightly underbaked. 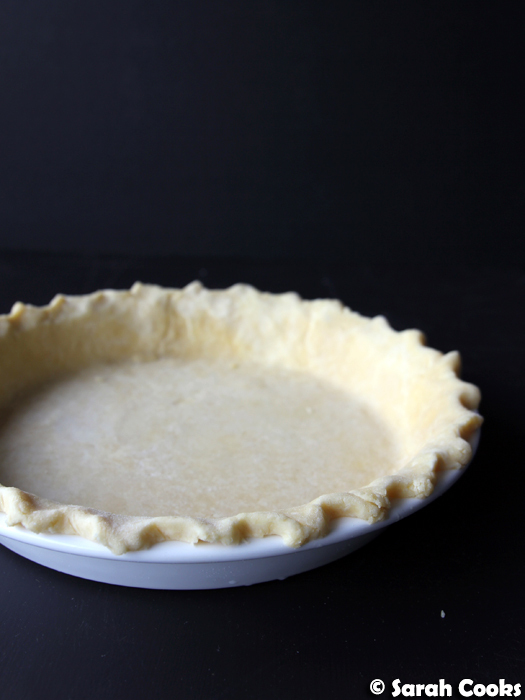 If you've got a metal or tempered glass pie dish, it would most likely conduct the heat better than my ceramic pie dish and the pastry would cook faster. However, if, like me, you've got a ceramic pie dish, I suggest blind baking the pastry case for 15 minutes, just to give it a little head start. The crumble browns quite quickly, so you want to make sure the pastry has a chance to cook through before the crumble burns. Having said that, no-one noticed apart from me, and my family gobbled up the pie greedily. So if you enjoy a crisp pastry and can be bothered blind baking, go for it! If not, it'll still be fine. More than fine! 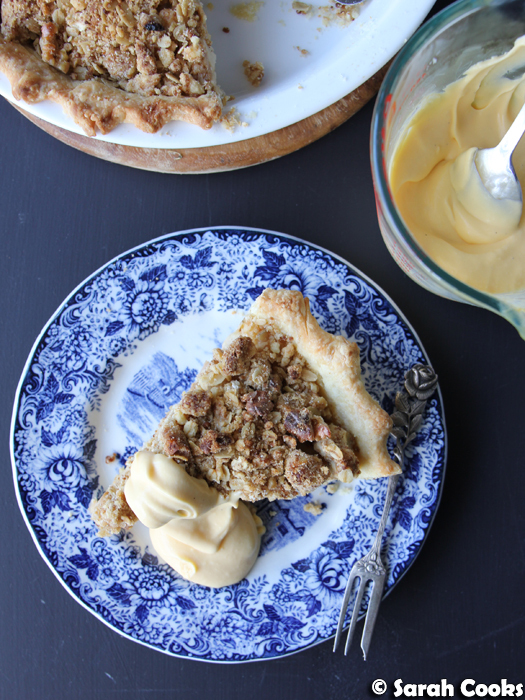 I chose to serve the pie with custard (homemade, of course), because crumble and custard are made to be together. But vanilla ice-cream, or whipped cream would be heavenly as well. Oh wow, this pie was so good! 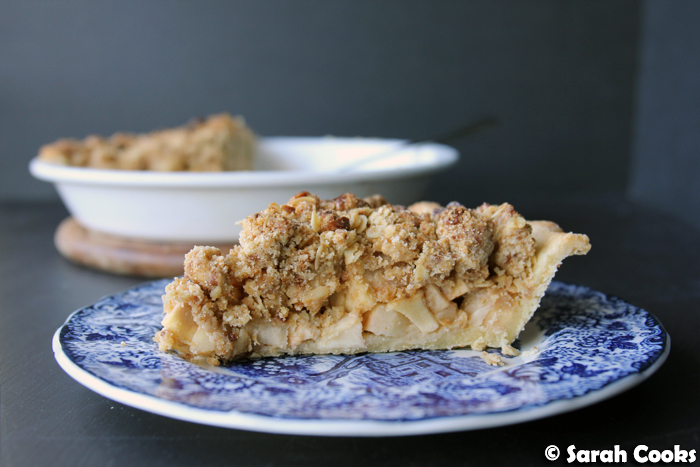 I loved the contrast of juicy tart apples against the crisp flaky pastry and the crunchy crumble. It was super buttery and had a lovely subtle hint of cinnamon. It was the perfect dessert for a relaxed Sunday dinner, but leftovers were also fantastic throughout the week. I'm super happy to be back with this recipe, and I hope you enjoy it as much as my family and I did! To make the pastry, place the flour, sugar and salt in a bowl and whisk to combine. Chop or grate the cold butter into small pieces. Add to the flour and rub in with your fingertips until the mixture resembles damp sand and the butter is evenly distributed. Make a well in the centre and pour in the 1/4 cup buttermilk, stirring with a fork to combine. Once it comes together in a shaggy dough, knead together and form into a squat disc. Wrap with clingfilm and refrigerate for one hour (or longer). On a lightly floured surface, roll the dough out into a 5mm thick rough circle. Lift the dough off the bench between rolls to make sure it doesn't stick to the bench. Gently ease the pastry to line a 20x4cm pie dish. Trim the edges and pinch to form a decorative border. Cover with clingfilm again and refrigerate for another hour or up to overnight. 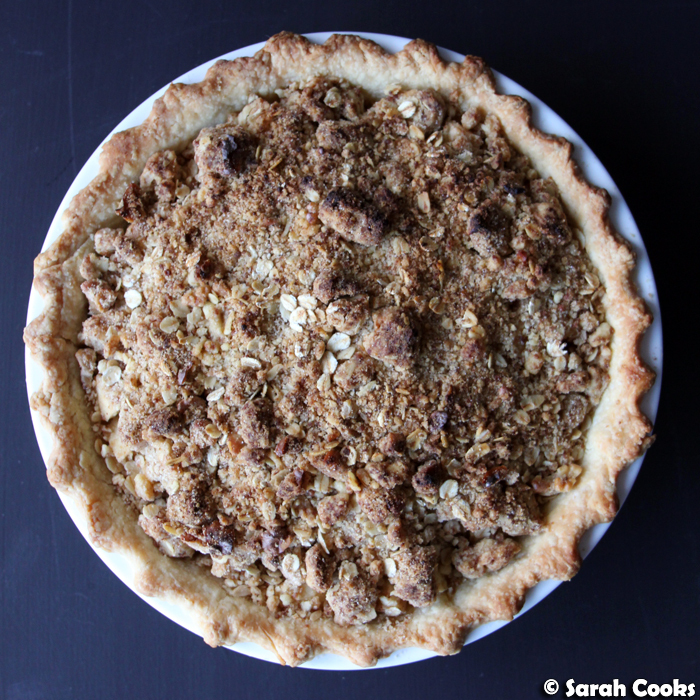 If you are not blind-baking the pie crust then simply proceed with the crumble and filling. If you are blind-baking the pie, (recommended if you are using a ceramic pie dish, less necessary for metal or tempered glass dishes), preheat the oven to 180C. Cover the pastry with foil, gently easing it to sit flush against the pastry, and making sure you cover the border. 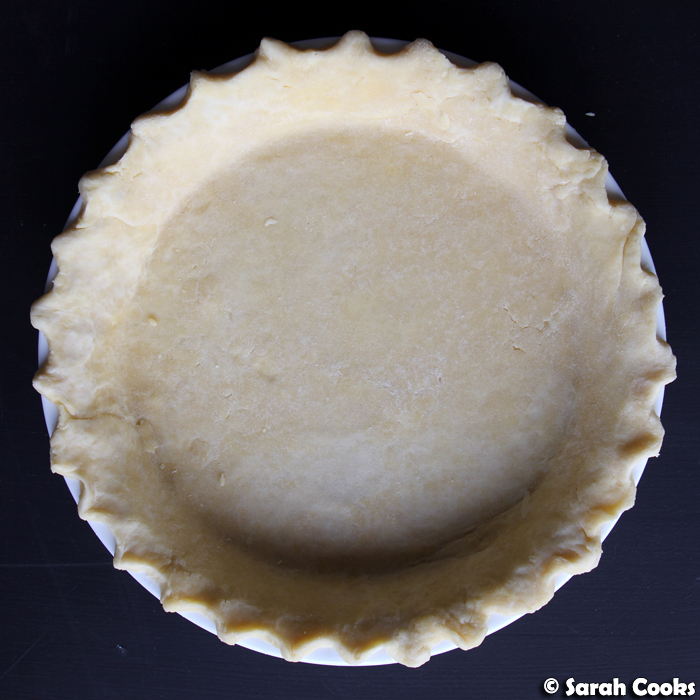 Fill the pie with pie weights, baking beans, or sugar. Place the dish on a baking tray and bake for 15 minutes. Remove from the oven, allow it to cool slightly, then remove the foil and pie weights. To make the crumble, chop or grate the butter into small pieces. Place the flour in a mixing bowl, add the butter and rub in with your fingertips until the mixture resembles damp sand and the butter is evenly distributed. Add the oats, sugars and walnuts and stir to combine. 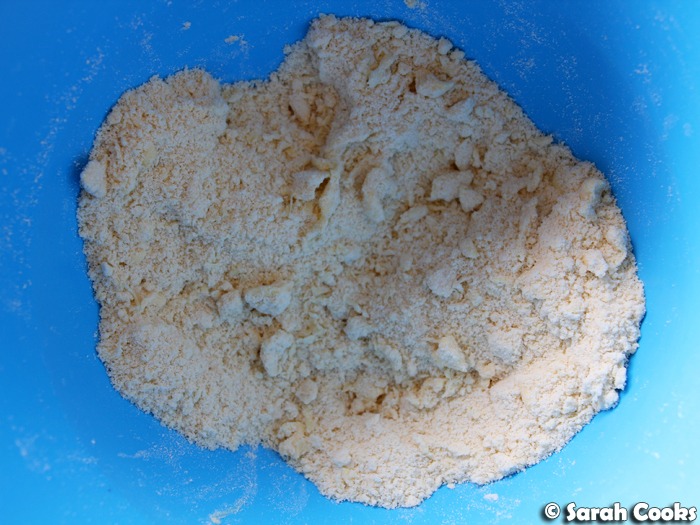 You can either proceed straight away or place the crumble mixture in an airtight container and refrigerate/freeze. To assemble the pie... Preheat the oven to 200C and place a baking sheet in the oven to heat up. 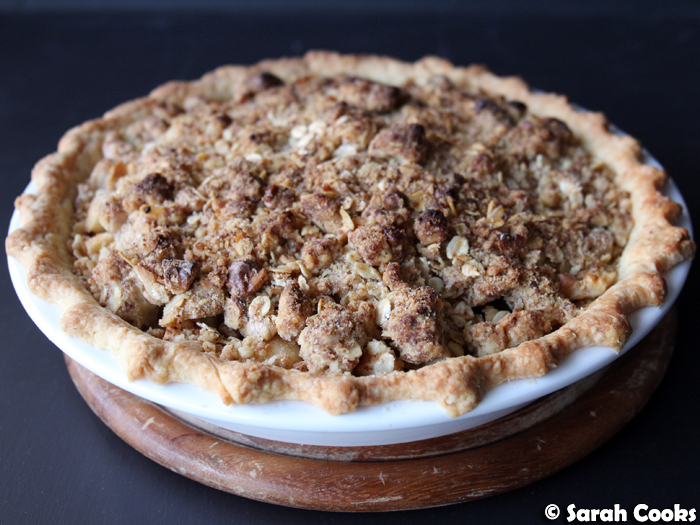 Take your pie crust (either raw or par-baked), and sprinkle the tablespoon of almond meal across the base. Tip in the apple mixture and distribute evenly. Cover with the crumble mixture (this recipe makes more crumble than you will need, freeze the rest for future crumble cravings). Place on a baking tray and bake for 15 minutes. Cover the pie with foil, turn the oven down to 180C and bake for a further 18 minutes. Allow to cool to lukewarm before slicing and serving. I guess I know what I'm making this weekend! Looks amazing!